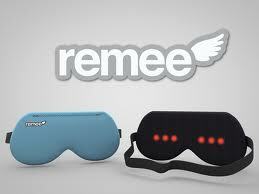 Remee Lucid Dreaming Mask – What Would You Dream About? Sometimes you come across a gadget that seems just a bit surreal, perhaps you saw the idea in a movie, and you thought to yourself that maybe someday in the far away future we might actually have something similar, what is hard to believe, is that some of what you thought was creative sci-fi imagination, is heading our way right now. How about mind control, ever think that would happen? Check out Remee, a special REM enhancing sleep mask that is supposed to help steer you into lucid dreaming, thats right, the premise is, that if your sleeping brain can be made aware that it is dreaming, you can train yourself to have the dreams of your choice. So fly, race cars or play the perfect round of golf, seriously, what would you choose to dream about if you could? Heres how the idea works, sleep stages are primarily non-REM and REM (REM being where most dreaming occurs) you cycle through these stages throughout the night with your REM stages lasting the longest towards morning, Remee notices these longer REM stages and “enters” your dreams via 6 red LED’s that you can “see” even with your eyes closed. You don’t wake up, but you are made aware that you are dreaming and can then learn to direct your dreams. You can customize Remee in order to accommodate different sleep styles, sleep patterns, or nap cycles, and you can adjust the intensity of the lights in case you have super thick or thin peeper lids but once you get it adjusted and spend some time with it, it seems like Remee can take us all to an alternate universe. My bags are packed. You can pre-order your Remee at sleepwithremee.com for only about 95 bucks. What a neat idea, never having had lucid dreams this would be something I would be willing to try out. Afraid the price will have to come done a bit first before I pick it up, I am not that curious. Yah the price seems high, cool idea though. I’d like to try it out! Are you nuts? $95 is too much? Pick up one extra shift at the gas station to pay for it. This gadget is for anyone who ever said “I would love to, if I had more free time”. You could be checking everything off your bucket list for under a hundered bucks! yea seriously… you can do anything in your life for only $100, you people are stoooopid if you think thats a high price point.